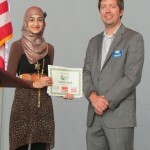 National History Day is a year-long historical research contest for middle and high school students. 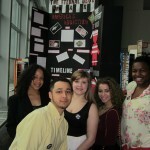 Each year, students from across the country develop a project based upon the annual contest theme. 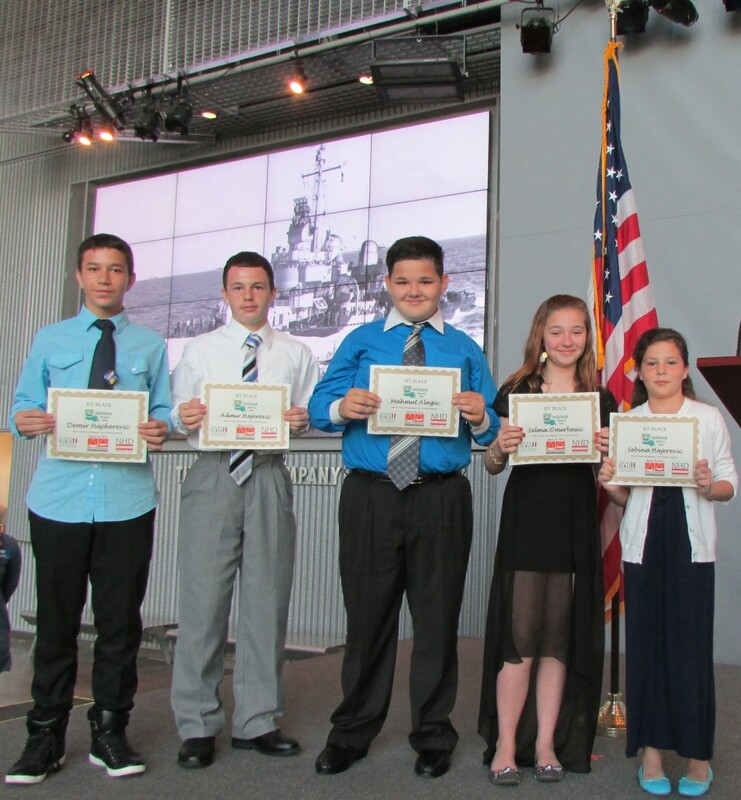 The annual theme for the 2016 National History Day contest is “Exploration, Encounter & Exchange;” a topic which also offers many opportunities for students to research and explore powerful subjects and events in WWII history. While images and figures from the Spanish Conquests or the Age of Sail are likely the first thoughts that spring to mind when most read and hear the words ‘Exploration,’ explorers existed in WWII as well, charting new paths in fields such as medicine, technology, and production while experiencing encounters and exchanges that would help change national attitudes towards isolationism, military preparedness and racial and gender equality. The outcomes of these WWII explorations varied, as did their encounters with opposition or resistance as well as the exchange of ideas or strategies that helped them to succeed or which caused them to fail, however, the outcomes and the lessons drawn from each of them are what determine why these events are important in history. For example, one case of Exploration between 1941–1945 with lasting importance in history was the exploration of infection and disease in attempts to cure and combat them. One staggering statistic to come out of the Pacific Theatre in WWII: over 80% of American troops deployed to the Pacific were hospitalized at least once, with infection and disease being among the leading causes. 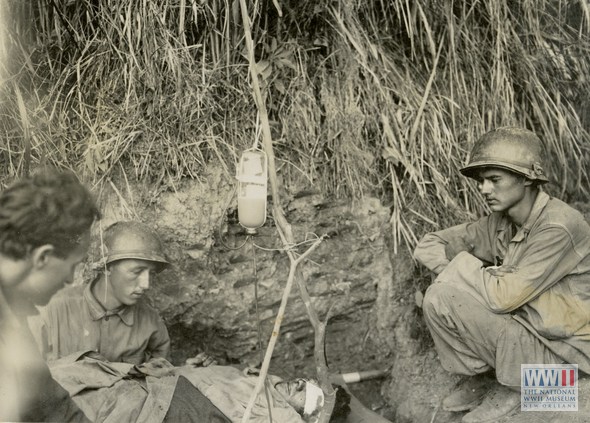 The United States responded to this harsh battle environment by exploring revolutionary treatment ideas such as the mass production of penicillin, sulfa drugs and the first use of blood plasma on the battlefield as seen in the image from the Museum’s Digital Collection. Similarly, military tactics in WWII had to change as a result of Encounters with new technology or Encounters with success or setbacks on the battlefield. 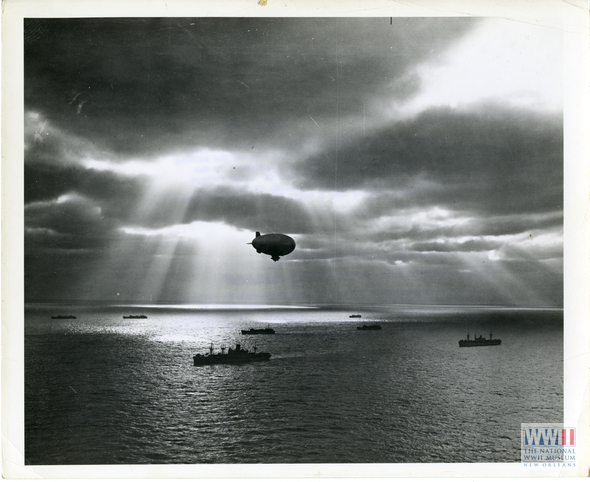 With German U-Boats menacing Allied shipping lanes during The Battle of the Atlantic, new tactics such as the convoy system, as seen in the image below, and technology like sonar helped to turn the tide. Similar adaptations existed on the Axis side as well, with Germany’s horrific encounters with trench warfare of WWI leading to new strategies such as the Blitzkrieg or ‘Lightning War’ which overran nearly all of Europe by the end of 1940. Finally, exchanges occurred throughout WWII history as well, from the large scale, such as the meeting of The Big Three – Roosevelt, Churchill and Stalin – at the week-long Yalta Conference which determined the end of WWII and the shape of the post-war world, to the individual, such as African-American serviceman Vernon Baker’s exchange with an prejudiced Army recruiter who at first refused his entry into the United States military based upon his race yet who later was awarded the Medal Of Honor, the highest award given by the United States Government for personal acts of valor above and beyond the call of duty. World War II is a rich and exciting time period in which to study the exploration, encounters and exchanges of The War That Changed The World – both famous and infamous – as well as what these events continue to teach us about history today. 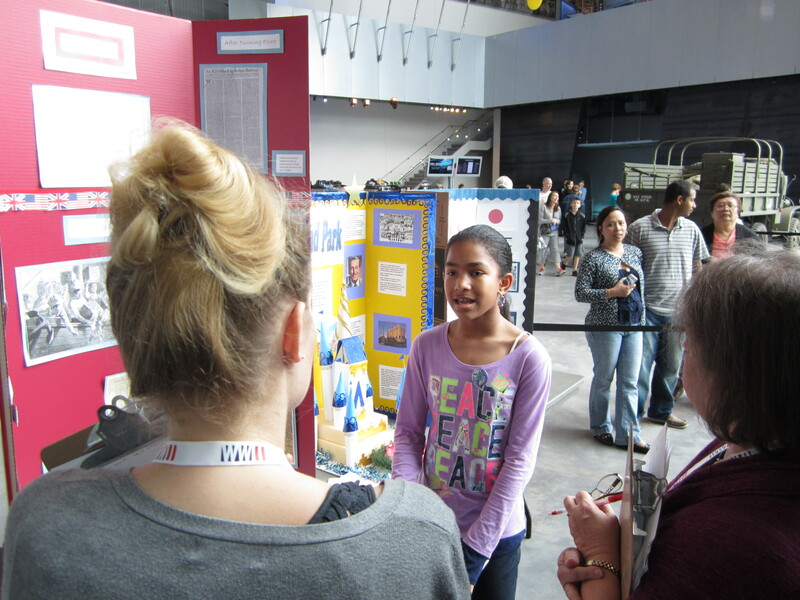 For more details about the National History Day contest and how to start your WWII research project, please visit The National WWII Museum’s NHD web page. 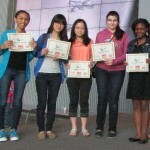 On Saturday, April 11, the Museum hosted the Louisiana National History Day state contest. National History Day is a student research competition in which students, either as individuals or in groups, conduct research and construct a project on a historical topic of their choice. Many of the students selected their topics in the fall and then spent much of the spring conducting research online, in libraries and at historical sites and archives. With the option to create either an exhibit, a documentary, a performance, a website or a documentary, students could display their research in the way they deemed most effective. At this year’s state contest, over 260 middle and high school students with over 150 projects in 18 different categories from all across the state competed throughout the day for prizes as well as a chance to advance their work and represent Louisiana at the National Contest in June in Washington D.C.. In all, 67 winning students were selected on Saturday and will travel on as Louisiana’s representatives in the National Contest at the University of Maryland on June 15 – 18. Best of luck to all our winners! 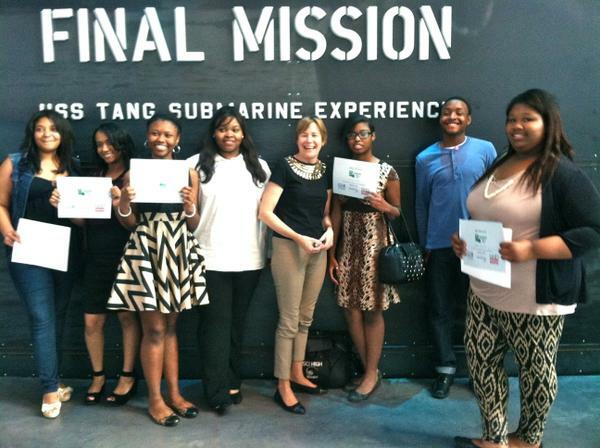 This past Saturday, March 21, the Museum hosted the Greater New Orleans National History Day regional contest. National History Day is a student research competition in which students, either as individuals or in groups, conduct research and construct a project on a historical topic of their choice. Projects in this year’s contest focused on the theme of “Leadership & Legacy in History” with student-selected topics ranging from General George Patton to Beyonce! At this year’s regional contest, over 230 middle and high school students with over 130 projects in 18 different categories competed throughout the day for a chance to advance their work to the Louisiana State History Day contest which will be held at the Museum on Saturday, April 11; the winners from that competition will then travel on to represent the state of Louisiana at the National Contest in Washington D.C..
National History Day is a year-long historical research contest for middle and high school students. Each year, students from across Louisiana create documentaries, research papers, performances, websites or exhibits based upon the annual contest theme. A major benefit to students participating in National History Day is the outside reviews of their work by volunteer judges, who donate their time to review students’ work, make suggestions for improvement and determine the entries that will advance to the next round. The National WWII Museum is looking for judges who possess both foundational knowledge of history and great communication skills, but who, above all else, enjoy working and encouraging middle and high school students. Judges are needed for the Regional and State Contests in New Orleans, Baton Rouge, Lafayette, Shreveport and Monroe. The New Orleans Regional Contest is set for Saturday, March 21 at The National WWII Museum. Judges arrive at 8:30 am for a brief orientation and are welcome to stay through the Awards Ceremony ending by 2:30 pm. The State Contest is scheduled for Saturday, April 11 in New Orleans also at The National WWII Museum. Judges at the State Contest will determine Louisiana’s delegation for the National Contest in Washington D.C.
Find out more about Louisiana’s History Day program and other Regional Contest Dates and how to sign up to be a judge! Don’t live in Louisiana? There is a National History Day program in all fifty states. You can find the contact information for your state’s program at the National History Day website. Also, if you are planning on being in the Washington, D.C. area in June, you can also inquire about judging at the National Contest. For more information on National History Day, contact the Museum’s Student Program’ Coordinator, Collin Makamson at 504-528-1944 ext. 304 or historyday@nationalww2museum.org. 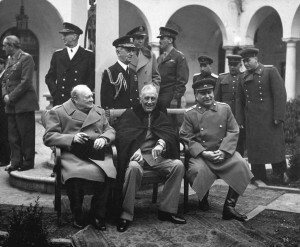 The Big Three – Churchill, Roosevelt and Stalin – at the Yalta Conference, 1945. Courtesy of the National Archives and Records Administration. Oftentimes, the actions of political leaders in WWII determined both their own legacies as well as the legacies of the nations which they led. For example, the decisions of The Big Three – Roosevelt, Churchill and Stalin – at the week-long Yalta Conference in 1945 determined the end of WWII and the shape of the post-war world. On other hand, the brief meeting of Nazi leadership at the Wannsee Conference in 1942 set in motion the policies of systematic extermination which resulted in millions of death in The Holocaust. Similarly, military leaders helped secure both their own legacies as well as the fates of their countries by their victories or defeats on the battlefield. Pioneering mobile warfare tactics were the key to many of General George Patton’s victories in WWII, with these tactics going on to shape American military tactics for years to come. Sometimes success as a military leader also took precise planning and organizational skills as was seen with Army Chief Of Staff George Marshall, who was both the “organizer of victory” as well as the architect behind the rebuilding of Europe through the Marshall Plan. Examples of leadership with lasting legacies from WWII are not found solely within high political or military office either. African-American activist A. Philip Randolph led the way in the desegregation of the American labor force in WWII while also laying much of the ground work for the post-war civil rights movement. Anna Mae Hayes served in the Army Nurse Corps during WWII before going on to become the first woman in the U.S. military to be promoted to the rank of general officer. Finally, while the leadership of individuals and their accomplishments during WWII are important, the legacies of these leaders in the post-war period should also not be overlooked. During WWII, First Lady Eleanor Roosevelt visited troops and help support the Tuskegee Airmen while, following the war, she worked to establish the United Nations to provide for peaceful ways of resolving international disputes, and pass the U.S. GI Bill of 1945, which promised to provide returning veterans with help and access to education, housing, and more. World War II is a rich and exciting time period in which to study and explore the clash between leaders – both famous and infamous – their actions and what their legacies can teach us today. 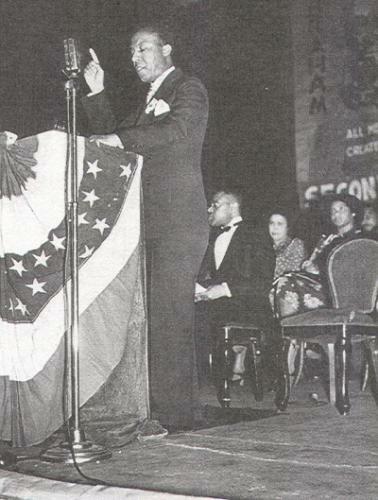 A Philip Randolph announcing the march on Washington D.C., 1941. Courtesy of the National Archives and Records Administration. 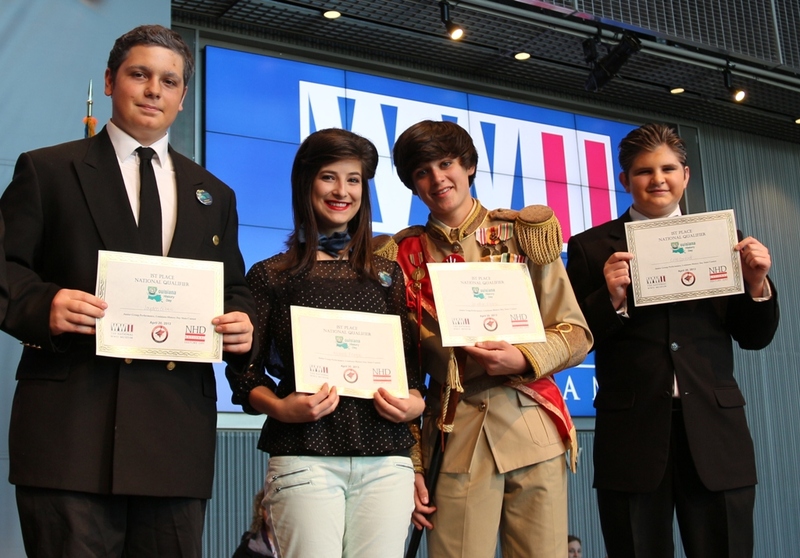 On Saturday, April 12, 250 middle and high school students from all across Louisiana arrived at The National WWII Museum for the National History Day State Contest. Months of research and planning went into these students’ projects which were conducted on historical topics of their own choosing. Many of the students selected their topics in the fall and then spent much of the spring conducting research online, in libraries and at historical sites and archives. With the option to create either an exhibit, a documentary, a performance, a website or a documentary, students could display their research in the way they deemed most effective. The theme of the Contest was “Rights and Responsibilities in History,” and to address this theme, many students chose topics focused on civil rights issues, labor struggles and the history of gun control. Each student’s project was reviewed by a panel of judges, and students were granted 15 minutes to answer questions related to their research process. The top 2 entries in each category were selected to represent Louisiana at the National History Day Contest to be held at the University of Maryland from June 15-19, 2014. 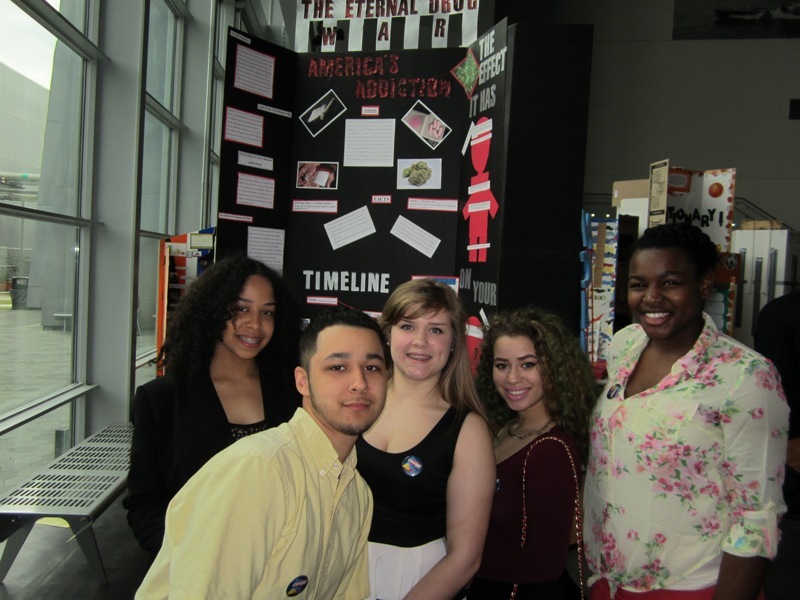 On Saturday, March 22, 2014, over 220 middle and high school students from five parishes in the New Orleans area competed in the New Orleans Regional History Day Contest. For these students, the Contest was the result of many months of researching, writing and perfecting their work on a historical topic of their choice. Judging panels evaluated student projects in five different formats—exhibit, research paper, performance, documentary and website. Students had the option to compete as individuals or in groups that could include up to four of their peers. 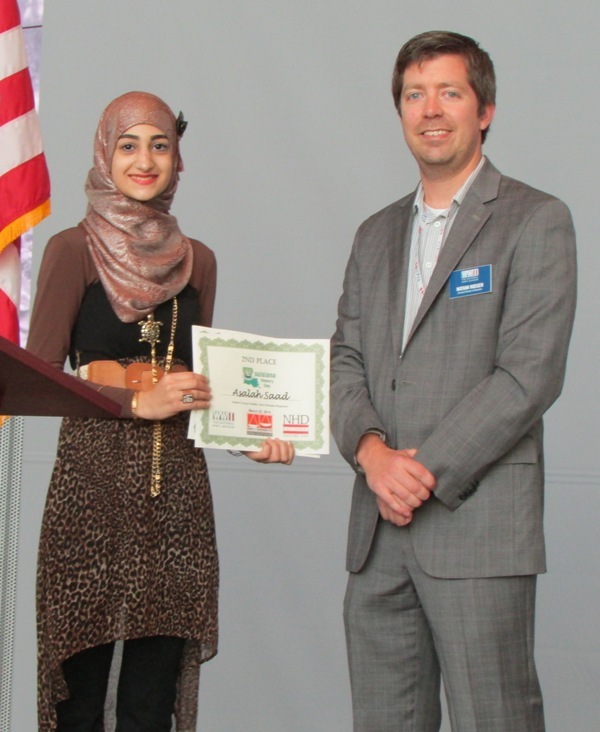 The 2014 Contest theme is “Rights and Responsibilities in History,” and this led to projects analyzing a wide range of topics such as child labor, Japanese American internment during WWII, the Civil Rights Movement and the military draft. Several projects stood out for their primary source research, including an exhibit on the treatment of individuals with Hansen’s Disease (formerly known as leprosy) by Hannah Adams from New Orleans Charter Science and Mathematics High School. A documentary on human rights in Bosnia and Herzegovina by Sebina Hajarevic, Admir Hajarevic, Selma Omerbasic, Mahmut Alagic and Demir Hajdarevic from Adams Middle School in Metairie, LA proved very powerful. Kelsey Billiot from St. Bernard Middle School in St. Bernard, LA impressed the judges with her exhibit on The Trapper’s War, a 1920s St. Bernard Parish Land rights dispute that turned violent. 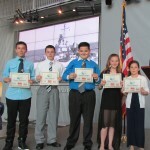 Students placing in the top four places in their categories advanced to the Louisiana State Contest to be held at The National WWII Museum on April 12. 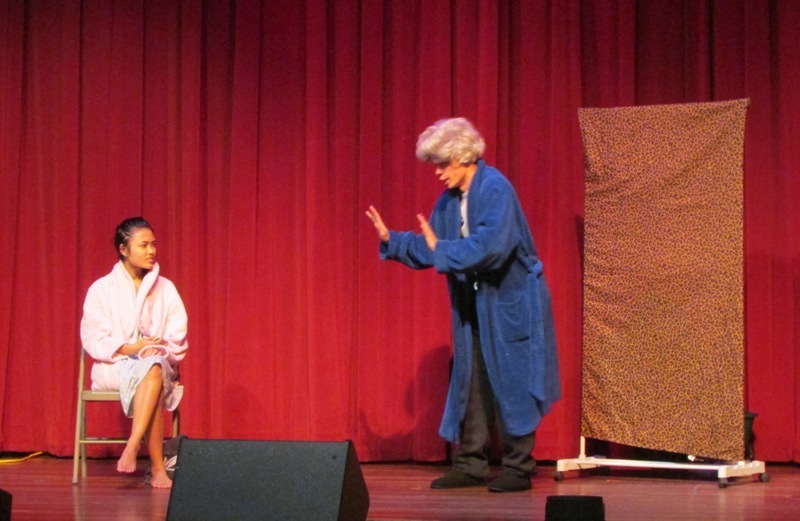 The top two entries in each category from the State Contest advance to the National Contest held at the University of Maryland from June 15-19, 2014. 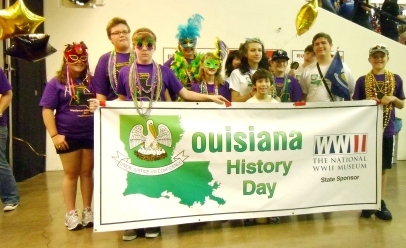 The Museum’s History Day program encourages Louisiana students to apply their historical research skills through the creation of documentaries, research papers, performances, websites or exhibits. A major benefit to participating students is the outside reviews of their work by volunteer judges. All levels of History Day contests feature judges who donate their time to review student work, make suggestions for improvement, and determine the entries that will advance to the next round. The National WWII Museum is looking for judges who possess good knowledge of history and great communication skills. Students will want clear suggestions for how to improve their project. The feedback that students receive is critical to their growth as researchers. Most of the students will not pursue history as their college major or career choice, but the skills that students use in creating their History Day projects will apply to any college and career path they choose. Judges are needed for the Regional and State Contests in New Orleans, Baton Rouge, Lafayette, Shreveport and Monroe. The New Orleans Regional Contest is on Saturday, March 22 at The National WWII Museum. Judges arrive at 8:30 am for a brief orientation and are welcome to stay through the Awards Ceremony ending by 2:30 pm. The State Contest is scheduled for Saturday, April 12 in New Orleans also at The National WWII Museum. 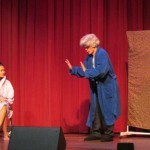 Judges at the State Contest will determine Louisiana’s delegation to the National Contest. Find out more about Louisiana’s History Day program and other Regional Contest Dates and sign up to be a judge! Don’t live in Louisiana? There is a National History Day program in your state. You can find the contact information for your state’s program at the National History Day website. If you are planning on being in the Washington, D.C. area in June, you can inquire about judging the National Contest. For more information, contact the Museum’s Assistant Director of Education Nathan Huegen at 504-528-1944 ext. 350 or historyday@nationalww2museum.org. 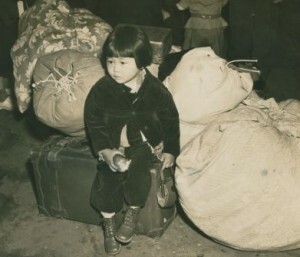 A young Japanese American evacuee waits with the family's luggage before leaving for an assembly center, 1942. Courtesy of the National Archives and Records Administration. 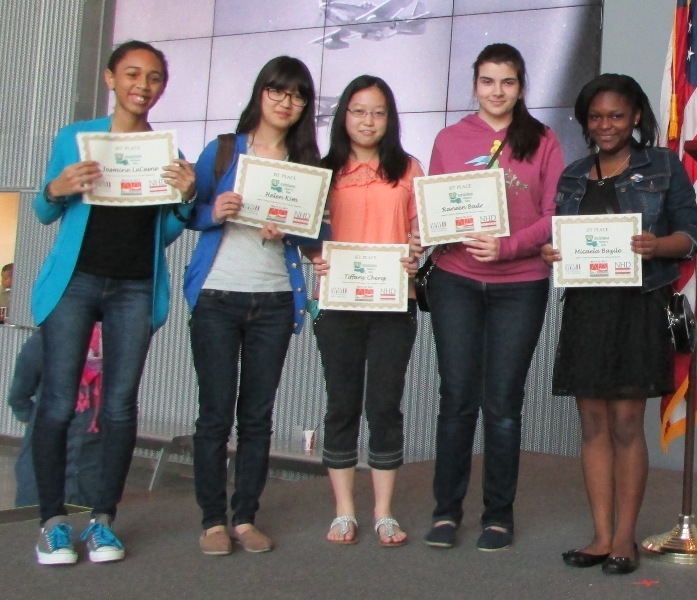 National History Day is a year-long historical research contest for middle and high school students. Each year, students develop a history project based upon a pre-selected contest theme. 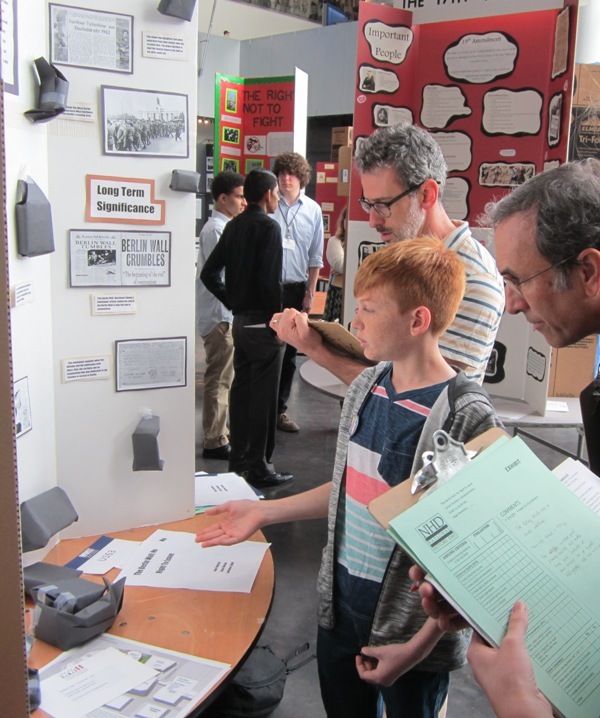 This year’s National History Day theme, “Rights and Responsibilities in History,” presents a wonderful opportunity for students to research and present on World War II topics and explore the realm of civics. When we think of the term “rights,” many of us tend to think of the rights that we have as American citizens, such as freedom of the press, freedom of speech, and freedom of worship. As citizens, we also have certain obligations or responsibilities to the country in return for such rights, like jury service, obeying laws, paying taxes for government services, and, in some cases, military service. During World War II, American citizens contributed to the country’s war effort in a variety of ways, including serving in the armed forces, working in factories to manufacture weapons and munitions, rationing, volunteering for the Civilian Defense Corps, and buying war bonds. However, rights in wartime could also be challenged or actively denied in the name of national security. Possible NHD topics that explore this issue of the restriction of rights include the experiences of Japanese-Americans and Native Alaskans from the Aleutian Islands who were forcibly relocated and placed in internment camps by the government, who viewed them as potential spies for the Axis powers. Students could also explore the question of rights and responsibilities by studying the Selective Training and Service Act of 1940. This act required all men between 21 and 45 to register for the military draft, and legally obligated those that had not already volunteered to serve in WWII if their lottery number was called. There is also the issue of discrimination faced by Latinos, African Americans and other Americans of color during the war as they fought for a “Double Victory” against both the Axis Powers abroad and over racism at home. 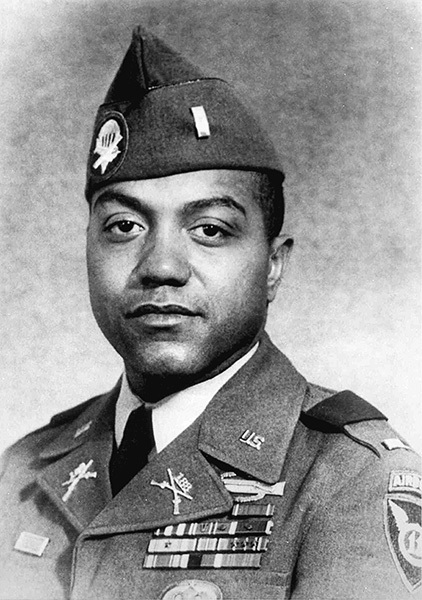 Examples include the Tuskegee Airmen, who were African American pilots that were trained in segregated facilities, and who went on to distinguish themselves in combat, as well as individuals like the late Senator Daniel Inouye, who, as both a Native Hawaiian and Japanese American, sought to prove his patriotism by volunteering to serve in the segregated Japanese American 442nd Regimental Combat Team. Additionally, there are many examples of moral dilemmas and obligations regarding the rights and humane treatment of combatants and civilians in this total war. These include the treatment of both Allied and Axis prisoners of war (POWs) under the Geneva Convention of 1929, President Roosevelt’s decision not to bomb the Nazi death camps towards the end of the war to slow the murder of Jews and other declared enemies of the Nazi state, and the Allies’ decision to conduct international war crimes trials to punish those accused of human rights abuses during the war. Students could also look at the work of the Allies’ Monuments Men to protect, preserve, and recover the cultural heritage of war torn Europe so that these artistic treasures could be enjoyed by future generations. Finally, don’t forget to look at events from the post-war period, too. Other great potential NHD topics are the post-war plans of Eleanor Roosevelt and others to establish the United Nations to provide for peaceful ways of resolving international disputes, and the U.S. GI Bill of 1945, which promised to provide returning veterans with help and access to education, housing, and more. World War II is a rich and exciting time period to study and explore the clash between the preservation of and the destruction of individual and collective rights, between democratic and totalitarian ideals, and the moral and civic responsibilities that men and women faced during a time of total war. 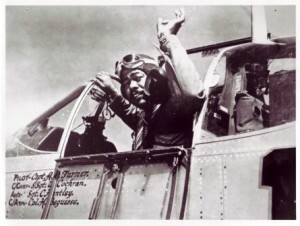 Tuskegee Airman Captain Andrew D. Turner in his P-51C fighter aircraft, 1944. Courtesy of the National Archives and Records Administration. Long-time donor The Selley Foundation is featured in this month’s donor spotlight! We spoke with Denis McDonald, Chairman of The Selley Foundation’s Board of Trustees, to learn more about why they have generously given in support of our mission for nearly a decade. Read on to find out how The Selleys wound up in New Orleans after growing up in Budapest, and why they enthusiastically support National History Day. Q: How did The Selley Foundation get started? Where did the foundation’s history begin? The seeds for the foundation were planted in the 1930s in Budapest, Hungary. Paul Selley was a young lawyer and his wife, Elizabeth, was a PhD in anthropology. In 1937, they saw the coming dangers in Europe and immigrated to New York City where they lived until after World War II. Elizabeth’s brother, Steve Danos, had immigrated to New Orleans for the shrimp business, and in the late 1940s he convinced Paul and Elizabeth to come to New Orleans and help them with the business. By 1970, Southland Canning, the name of their company, was the largest shrimp and oyster canner in the United States. Shortly thereafter, it was sold to PET FOODS for about 7 million dollars. Paul retained his PET FOODS stock, which was worth about $3.5 million, and low and behold a few years later PET FOODS was bought out by IC Industries for double the price. Paul now had $7 million in cash. He invested it wisely and by the time he died in 1995 he left $13 million to fund The Selley Foundation. Since his death, the foundation has given away over $5 million and its net worth is close to $20 million. Q: How did The Selley Foundation first become involved with The National WWII Museum? Shortly after The Selley Foundation was started in 1989, Paul served with Louis Freeman on the board for the New Orleans Museum of Art. He recognized Louis’s ability with investments, so Paul asked me if I would solicit Louis to become a Selley board member. It was the easiest selling job I ever had. Louis agreed immediately and has served ever since. One might say that it was Louis Freeman who made The Selley Foundation board aware of the mission of The National WWII Museum, since he has also served on the Museum’s board for quite some time. Q: The Selley Foundation has sponsored a range of Museum initiatives, including Louisiana History Day, an endowment for collections and exhibits, and our Road to Victory Capital Campaign. What about The National WWII Museum’s work helps fulfill The Selley Foundation’s mission? The Selley Foundation’s stated mission is to assist in the areas of education, arts, and culture. There is no question that Paul and Elizabeth were most interested in Europe, their homeland, and the role that D-Day played in securing liberty and freedom in many countries of Europe and eventually Hungary. The Museum fits the bill. The Selley Foundation’s sponsorship of National History Day is a double whammy. Paul and Elizabeth would be most proud to see the history projects of these young, inquisitive minds. Their results on the national stage are outstanding. Q: On behalf of The Selley Foundation, what are the ways that you have seen the foundation’s investment lived out through the Louisiana History Day competition? Paul and Elizabeth left some notes to future Trustees and it is clearly stated that their interest is to influence young minds to achieve excellent education and knowledge. I have witnessed several of the projects and talked with some of the young and knowledgeable researchers. National History Day clearly fits the mission of the vision that the Selleys had. Q: Can you share with me any of the interactions that you have had with some of the participants and beneficiaries in the competition? The young Aiden Edler from Chalmette, Louisiana. I was extremely impressed with him. 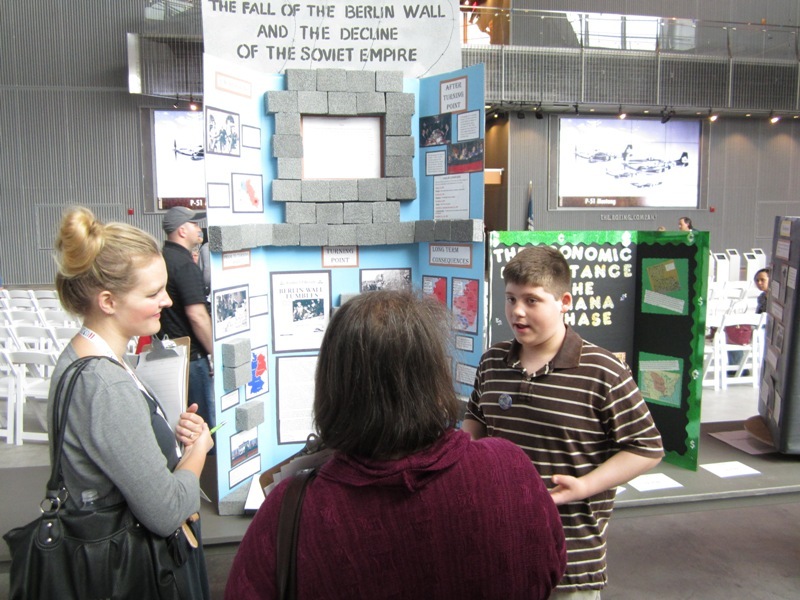 I vividly remember Aiden and his exhibit on the Berlin Wall and how it changed history. I was impressed that he was only a 6th grade student at the time of competition, the lowest grade level allowed to compete. His age was overshadowed by his expertise. Q: How does it feel to know that with The Selley Foundation’s support this program has grown from 189 participants in 2011 to over 1,200 in 2013, including 70 national qualifiers? The regional growth in the number of participants and the large number of national qualifiers is amazing. Paul and Elizabeth would be very proud of this sponsorship. Our Board of Trustees is also pleased. Q: How does The Selley Foundation want to be remembered? The Selleys and their foundation would be honored to be remembered as having encouraged and assisted young students in becoming curious, educated, thoughtful, and responsible adults. When Paul wanted to compliment someone he would say that he or she was a good citizen. That was his way of giving the ultimate compliment. He would be proud to have assisted so many good citizens. We are thankful for The Selley Foundation’s commitment to the Museum’s programs. Their generous support ensures that we can advance our mission to tell the full story of the American experience in the war that changed the world. 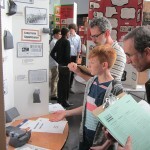 Click here to find out more about how to participate in the National History Day competition. Aiden Edler is currently a 7th grade student from Andrew Jackson Middle School in Chalmette, Louisiana. Here he answers questions about his exhibit on the Berlin Wall and how it changed history.